Here's an explanation for the headlines above: rainfall in Texas governs horn growth. It cannot get any more basic than that. But as we learned once the season got underway, rainfall can have a detrimental effect on hunting whitetails. What on earth do all these contradictory statements mean? Up until late summer in 2018, range conditions on most of the ranches we hunt were grim - mighty grim. Following a dry fall in 2017, the few rains which came our way in 2018 were scant and ineffective with little to no growth of winter or summer green plants. Bucks were finding poor nutrition for the task of growing antlers. To be sure, there were small parcels of the rangeland in better shape with more moisture, but overall, it was a sho'nuff drought. Until mid-August, that is, when rains began to come our way. Then more rains. Then finally a deluge in late September/early October. Reports from fellow ranchers claimed totals from a dozen to twenty inches of rain. We old-timers had never seen anything like it. Of course by now, horn growth on the bucks was nearing completion. The soon-to-come uptick in plant life was too late for antler production. And now it was time to fill our 100+ corn feeders. But how? Roads were impassable with draws and creeks running bank full. Sacks of corn in pickup beds were getting wet. And some of our feeders were sitting in water of various depths, from a few inches to a few feet. Blinds, too. One even washed 75 yards down stream. On an early hunt in November when we had scheduled to use 32 different blinds and feeders, only 16 of them were in operation. Some were inaccessible; some were under water. But so what? We were soon to learn an important truth. By mid-November, it became clear that our deer had no interest in our corn feeders. Why? The plethora of winter weeds had now grown as if on steroids following all that rain. A deer had only to walk a dozen steps in any direction to get a belly-full of nutritious and palatable groceries. Yes, the younger, immature bucks visited the corn feeders and our new hunters were amazed at their numbers. But the few "shooter" bucks seen by our troops would wander by the location in search of a hot doe then drift on to wherever. The observation was made: Now we are learning what Texas whitetail hunting would be like if corn feeders were outlawed. The doe harvest is our one tool to help manage our deer herd. Consulting biologists issue doe harvest goals and we do our best to reach them. But how can that be done if does simply do not show up at corn feeders? 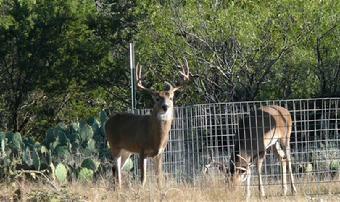 All along, hunters were encouraged to take two antlerless deer apiece. As we neared the end of the season and found ourselves way behind, the quota was upped to three does. Very few got that done simply because they never saw a doe. All they were seeing were the small bucks. From year to year, we keep no statistics on the size of our bucks. After 30+ years of watching such things, it is abundantly clear that horn growth varies according to the rainfall, as described above. 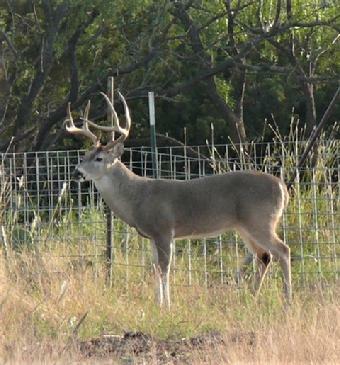 In a really good season, bucks will be 15 inches larger than during a really poor year. And so it was this year. 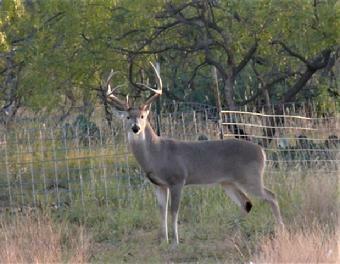 The buck's antlers were smaller, as many of our veteran hunters noted on their post-hunt questionnaire. Indeed, it was the correct year to hunt under our unique "Trophy Option" price, described elsewhere on this website. 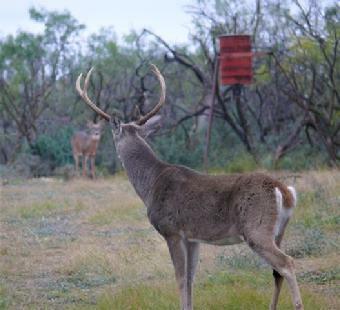 Historically, each year 65-75% of the Trophy Option hunters find a buck that meets their standards. Our statistics show that only 32.4% did so during the dismal 2018 season. So thank goodness for the Trophy Option pricing. It worked like it was supposed to work. Below you can see some of the bucks that were photographed but were turned down by the hunters. What is the most remarkable statistic of them all? Despite this most difficult year, our bookings for 2019 are at historic levels. No doubt, before the 2019 season begins, changes will occur. They always do. Hunts get cancelled for various reasons. Let us know if you would like to be placed on our waiting list. This blind is laying on its side in a couple of feet of water. When uprighted, it tipped over again during a subsequent flood. See the distant feeder. The water lacks only a couple of feet in reaching the bottom of the barrel - probably five feet deep. And that pond is now large enough to accommodate a water skier. This area has been bone-dry for the past decade. Such a scene was a common early in the 2018 season. The ground below the feeder never dried up all season long and was totally out of play. Here is a road approaching a blind that turned into a river. The blind could only be approached from the south, not the north. And this stream, normally dry as a bone, ran like this all during the 2018 season. The ranch could not be crossed - you had to go around on the highway. When a hunter reaches for his camera on a buck like this one instead of his gun, you know he is a trophy hunter for sure. One of our guides says this is a 150-class buck. What he means is that 50% of our hunters would take him down on the first day. But this photographer let him walk. Bucks always look larger from the rear or when going away. There's no telling what this dude looked like from the front. But even from the rear, the hunter turned him down. This buck was remarkably similar to one taken later in the season. But our faithful photographer, remembering earlier, better years, was looking for something carrying way-more inches on his head..